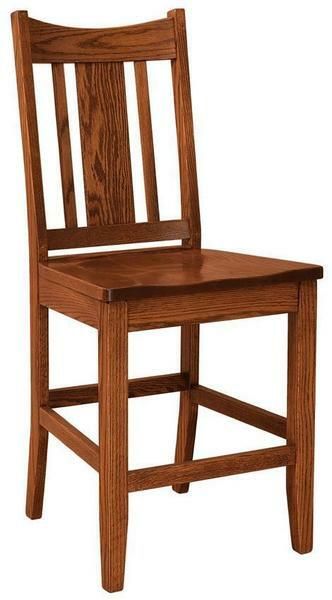 The elegance of mission style furniture is clearly defined in the Amish Kodiak Mission Bar Stool from DutchCrafters. Bring this simple yet sensational style to your kitchen counter and marvel at construction you and your family can count on. Creative slat work contributes to the bar stool back, while crisp, clean lines contribute to the shapely legs and seat form. You'll enjoy more time in your kitchen with this mission style bar stool seating adding the comfort and style that you can help to customize. We offer the Kodiak in a matching swivel bar stool and dining chair. This Arts and Crafts style furniture maintains its appeal throughout the years. Coupled with Amish construction that provides durability and beauty, it's a winning combination for your kitchen furniture collection. Equip your kitchen counter or bar with the right height. We offer a 24" counter or 30" bar height for these solid wood stools. Choose from nine solid wood options to fashion your stools. Rustic woods offer a more rugged and natural look if you prefer. Seat Height from Back: 20"